Hedge Funds Have Never Been This Bullish On Imperial Oil Limited (IMO)? While the market driven by short-term sentiment influenced by uncertainty regarding the future of the interest rate environment in the US, declining oil prices and the trade war with China, many smart money investors kept their optimism regarding the current bull run in the fourth quarter, while still hedging many of their long positions. However, as we know, big investors usually buy stocks with strong fundamentals, which is why we believe we can profit from imitating them. In this article, we are going to take a look at the smart money sentiment surrounding Imperial Oil Limited (NYSE:IMO). Imperial Oil Limited (NYSE:IMO) was in 19 hedge funds’ portfolios at the end of December. IMO investors should be aware of an increase in activity from the world’s largest hedge funds of late. There were 17 hedge funds in our database with IMO positions at the end of the previous quarter. Our calculations also showed that IMO isn’t among the 30 most popular stocks among hedge funds. Let’s take a look at the recent hedge fund action regarding Imperial Oil Limited (NYSE:IMO). How are hedge funds trading Imperial Oil Limited (NYSE:IMO)? At Q4’s end, a total of 19 of the hedge funds tracked by Insider Monkey were long this stock, a change of 12% from one quarter earlier. 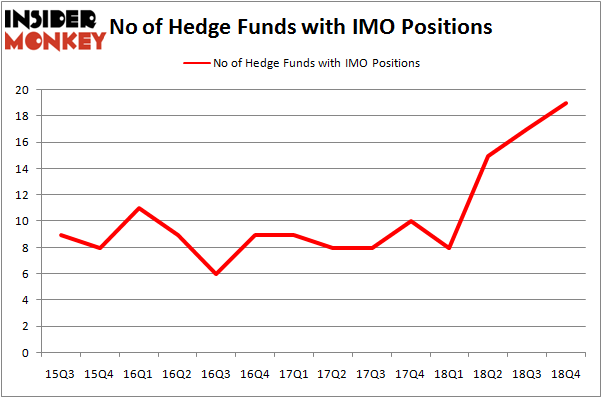 The graph below displays the number of hedge funds with bullish position in IMO over the last 14 quarters. So, let’s find out which hedge funds were among the top holders of the stock and which hedge funds were making big moves. Among these funds, D E Shaw held the most valuable stake in Imperial Oil Limited (NYSE:IMO), which was worth $33.3 million at the end of the third quarter. On the second spot was Renaissance Technologies which amassed $13.2 million worth of shares. Moreover, Two Sigma Advisors, AQR Capital Management, and Point72 Asset Management were also bullish on Imperial Oil Limited (NYSE:IMO), allocating a large percentage of their portfolios to this stock. As aggregate interest increased, key hedge funds were breaking ground themselves. Millennium Management, managed by Israel Englander, initiated the most valuable position in Imperial Oil Limited (NYSE:IMO). Millennium Management had $1.3 million invested in the company at the end of the quarter. Ronald Hua’s Qtron Investments also initiated a $0.2 million position during the quarter. The only other fund with a new position in the stock is Gavin Saitowitz and Cisco J. del Valle’s Springbok Capital. Let’s also examine hedge fund activity in other stocks similar to Imperial Oil Limited (NYSE:IMO). These stocks are Fresenius Medical Care AG & Co. KGaA (NYSE:FMS), TELUS Corporation (NYSE:TU), Discover Financial Services (NYSE:DFS), and Kellogg Company (NYSE:K). This group of stocks’ market caps resemble IMO’s market cap. As you can see these stocks had an average of 20.75 hedge funds with bullish positions and the average amount invested in these stocks was $365 million. That figure was $95 million in IMO’s case. Discover Financial Services (NYSE:DFS) is the most popular stock in this table. On the other hand Fresenius Medical Care AG & Co. KGaA (NYSE:FMS) is the least popular one with only 8 bullish hedge fund positions. Imperial Oil Limited (NYSE:IMO) is not the least popular stock in this group but hedge fund interest is still below average (even though it is at its all time high). This is a slightly negative signal and we’d rather spend our time researching stocks that hedge funds are piling on. Our calculations showed that top 15 most popular stocks among hedge funds returned 19.7% through March 15th and outperformed the S&P 500 ETF (SPY) by 6.6 percentage points. Unfortunately IMO wasn’t in this group. Hedge funds that bet on IMO were disappointed as the stock returned 8.6% and underperformed the market. If you are interested in investing in large cap stocks, you should check out the top 15 hedge fund stocks as 13 of these outperformed the market. 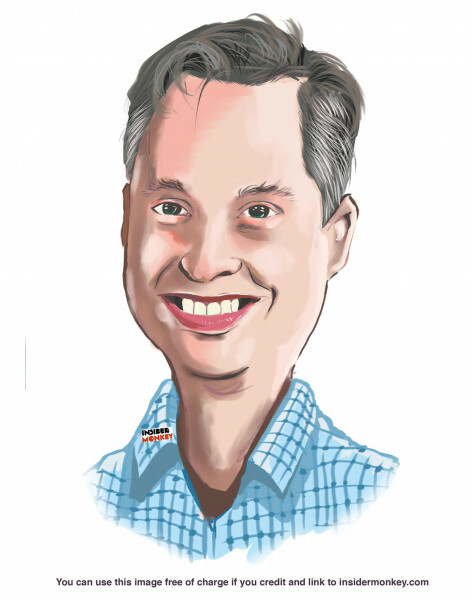 Here’s What Hedge Funds Think About T. Rowe Price Group (TROW) Here is What Hedge Funds Think About Canadian Imperial Bank of Commerce (CM... Were Hedge Funds Right About Ditching V.F. Corporation (VFC) Here is What Hedge Funds Think About Credit Suisse Group (CS) Is TransCanada Corporation (TRP) A Good Stock To Buy According To Hedge Funds... Is Fidelity National Information Services (FIS) A Good Stock To Buy?